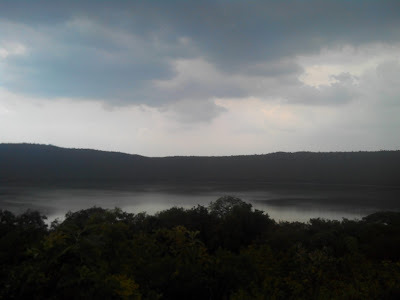 I had high expectations from this trip of Lonar. For starters, Lonar is Maharastra's - and also India's - only hyper-velocity meteorite impact crater lake. 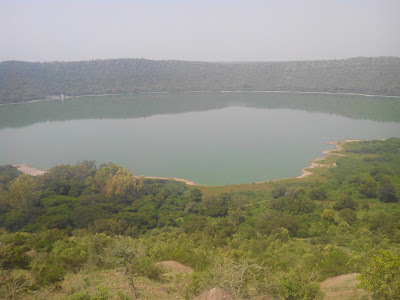 The circular crater has a diameter of about 1.8km and the lake in the middle has some highly alkaline water. 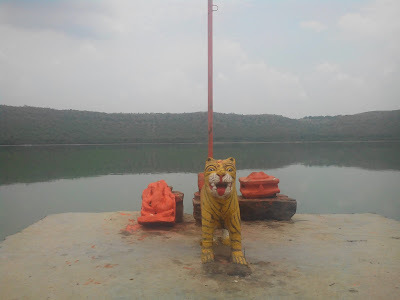 The crater - like all things celestial - has been given some amount of importance in the Hindu mythos which can be judged by the number of temples that surround the lake - 27 in all. This trip was done around the second weekend of September, 2015. That's almost near the end of monsoon. Tejal had joined me for this trip. The plan was to reach Lonar via Jalna, spend the day there, then cover Sindkhed Raja - birthplace of Shivaji's mother, Jijabai - the next day and return to Mumbai via Jalna. The 17057 Devgiri Express departs Mumbai at 2110 hrs everyday and reaches Jalna by 0500 hrs. This train is usually full and ends up bearing quite a lot of unreserved passengers. There's an early morning Aurangabad-Akola bus that connects Jalna and Lonar. It departs from Jalna at about 0600 hrs. and drops off at Lonar by 0800 hrs. The fare is nearly Rs. 150. At a first glance, Lonar appears like any slow-moving Indian village; and it is largely true. One would expect some hustle due to the proximity of the lake, but the place simply does not get the expected number of tourists. The Krishna Lodge near the bus stand is supposed to be a decent place to stay. The other option - and chosen by most tourists - is the MTDC next to the lake, about 1 km south-west from the bus stand. Another option is the PWD guest house. The old guest house is located bang on the eastern arc of the crater rim, but was under maintenance due to a broken water tank. The newer one is close by. These can, however, only be booked by writing a letter to the PWD office in Buldhana. Where did we stay? Well, we did not stay in Lonar after all. After reaching Lonar, we straight up went to the MTDC. The place was full, but the guy at the reception kindly spared us a room to freshen up. The PWD, as expected, did not entertain us without the letter from Buldhana office. We decided to skip the accommodation search and check the Crater Lake first. 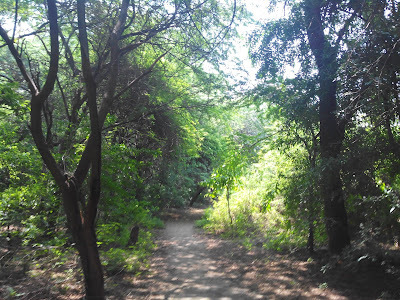 One of the paths to descend to the lake starts from the old PWD guest house. 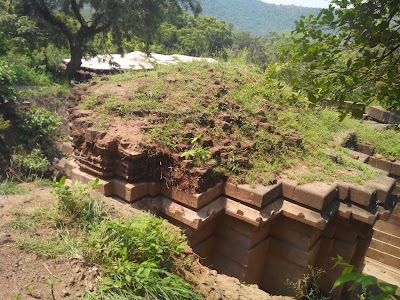 The path is mostly gravel and descends with switchbacks for about 150 feet till it levels our near a set of temple in varied stages of dilapidation. 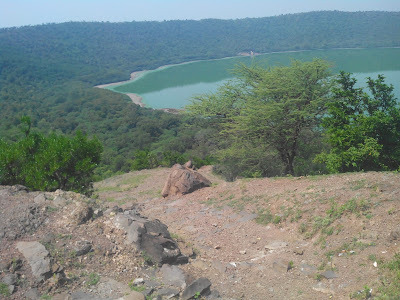 There are 27 temples in the crater that surround the lake. A few of these have a documented history. This documentation is available in guidebooks, but none of the temples actually even bear a name-plate. Information about the temples and the lake composition can be found in the Wikipedia page. The crater around the lake is densely forested and a broad trail runs around the lake through this forest. The forest has a decent population of langoors and some birds, which I fail to identify. There are quite a few peculiar insects as well. 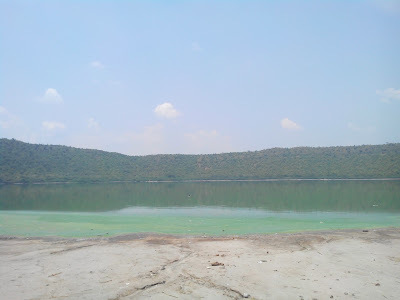 The lake, however, is highly alkaline and constantly spews an odor similar to that of Hydrogen Sulphide (H2S) - also knows as the odor of rotting eggs. There is no 'regular' life to be observed in the lake. The langoors and the birds do venture close to the water, but never touch the water. The forest masks most of the odor, but once one ventures close to the water, it seems impossible to stay there for more than a few minutes. 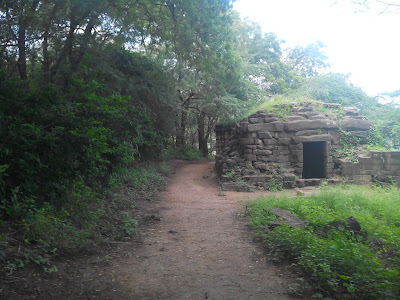 We completed half of the 6km circumference walk around the lake, a little beyond the Kamaljamata Temple, when the trail seemed to disappear in the forest. We decided to turn around, and since the odor had started making us feel queasy, we decided to abort Lonar altogether. In our haste, we skipped a few important places like the Daityasudan Temple which were actually located a bit away from the water. There was a slight drizzle by the time we left the crater at 1430 hrs. We decided to skip Sindkhed Raja too, and head straight for Aurangabad. We eventually left Lonar at 1530 hrs in a bus that dropped us at Sultanpur. From there it was another bus ride of about 3 hours to Aurangabad. 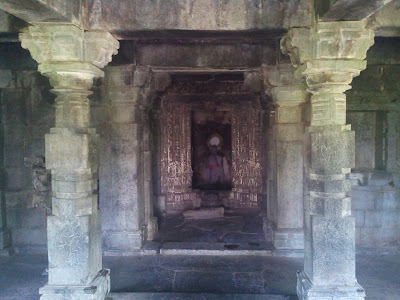 We had missed most of our objectives of this trip, but the upside was that we would be in Aurangabad with a day to spare and could make an attempt for Ajanta caves, Ellora caves or Deogiri-Daulatabad. Also, it happened that some insect bit Tejal on her ankle during our walk around the lake. The harmless looking prick, later transformed to a very ugly infection. There was something queer about Lonar. 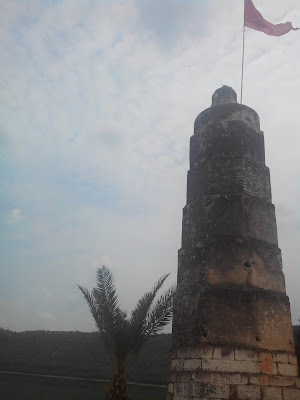 Throughout our time near Lonar and Sultanpur, we came across men in groups of three. And none - except one - of the groups we met were remotely friendly. The group at Sultanpur appeared to be downright hostile asking what we were up to in these back country areas. Also, we realized that Tejal was the only visible female in and around the crater at that time. So it was immediately decided that my pen-knife belonged in by hand and not in my bag. 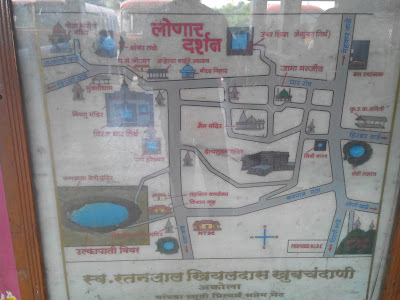 Another observation was the apparent lack of Marathi, even though this area is the geographical centre of Maharashtra. Not saying that the Hindi/Urdu was chaste either. 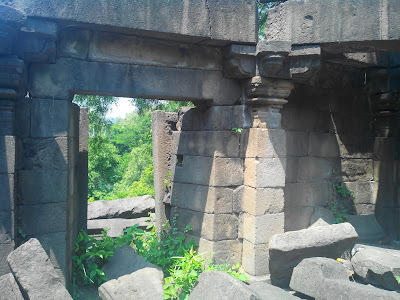 I'll probably be back in Lonar sometime in the future to check on the places that we missed. Anyway, it is a beautiful place to set up a camp. I'll just have to be better prepared though. he he he... yeah the infection... Phew! healed after 3 months of medication..
A new place for me , is well described with pictures !! I visited it years back but just the lake. I didn't do the elaborate temple trail. I hope to get back there for that! And when you do, remember to hire a guide. 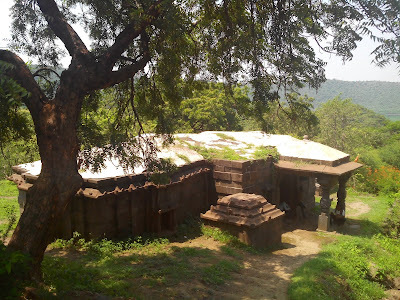 The trail can get confusing beyond the Kamaljamata Temple.